جمالی, حسین, مظفری نیا, رضا. (1394). تولید و مشخصه‌یابی پوشش محافظ ژرمانیوم-کربن. 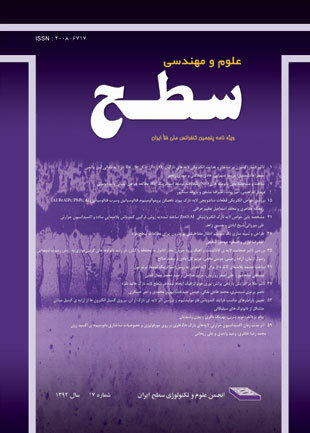 نشریه علوم و مهندسی سطح, 11(26), 1-9. حسین جمالی; رضا مظفری نیا. "تولید و مشخصه‌یابی پوشش محافظ ژرمانیوم-کربن". نشریه علوم و مهندسی سطح, 11, 26, 1394, 1-9. جمالی, حسین, مظفری نیا, رضا. (1394). 'تولید و مشخصه‌یابی پوشش محافظ ژرمانیوم-کربن', نشریه علوم و مهندسی سطح, 11(26), pp. 1-9. جمالی, حسین, مظفری نیا, رضا. تولید و مشخصه‌یابی پوشش محافظ ژرمانیوم-کربن. نشریه علوم و مهندسی سطح, 1394; 11(26): 1-9. هدف از پژوهش حاضر، تولید پوشش محافظ ژرمانیوم-کربن به وسیله فرآیند رسوب‌دهی شیمیایی از بخار به کمک پلاسما (PECVD) با استفاده از پیش‌ماده‌های گازی ژرمان (GeH4) و متان (CH4) و سپس مشخصه‌یابی آن است. برای این منظور، از میکروسکپ الکترونی روبشی گسیل میدانی (FESEM) مجهز به طیف‌سنج تفکیک انرژی (EDS)، پراش‌سنج پرتو ایکس (XRD)، طیف‌سنج مادون‌قرمز تبدیل فوریه (FTIR)، طیف‌سنج فتوالکترون پرتو ایکس (XPS)، طیف‌سنج فروشکست القائیده لیزری (LIBS)، آزمون نانوفرورونده و آزمون چسبندگی استفاده شد. بر اساس ارزیابی ساختاری، پیوند خوردن برخی از اتم‌های ژرمانیوم با اتم‌های کربن و وجود زمینه ژرمانیوم-کربن در پوشش اثبات شد. همچنین نتایج، نشان دهنده تشکیل پوشش ژرمانیوم-کربن آمورف به صورت یک لایه متراکم، همگن و عاری از هرگونه تخلخل و ناپیوستگی با چسبندگی بسیار مناسب به زیرلایه بود. مقدار سختی و مدول الاستیک پوشش ژرمانیوم-کربن به ترتیب حدود 1/7 و GPa 1/95 به دست آمد. D.C. Harris, Materials for infrared windows and domes properties and performance, SPIE, Washington, 1999. Y. Li, Z. Liu, H. Zhao and L. Feng, Infrared transmission properties of germanium carbon thin films deposited by reactive RF magnetron sputtering, Vacuum, 83(2009)965-969. X. Wu, W. Zhang, L. Yan and R. Luo, The deposition and optical properties of Ge1-xCx thin film and infrared multilayer antireflection coatings, Thin Solid Films, 516(2008)3189-3195. F. Davanloo, T.J. Lee, D.R. Jander, J.H. You, H. Park and C.B. Collins, Mechanical and adhesion properties of amorphic diamond filmsMechanical and adhesion properties of amorphic diamond films, Thin Solid Films, 212(1992)216-219. C. Jiang, J. Zhu, J. Han and W. Cao, The surface topography, structural and mechanical properties of Ge1−xCx films prepared by magnetron co-sputtering, Journal of Non-Crystalline Solids, 383(2014)126-130. J. Vilcarromero and F.C. Marques, Hardness and elastic modulus of carbon-germanium alloys, Thin Solid Films, 398-399(2001)275-278. L.G. Jacobsohn , F.L. Freire and G. Mariotto, Investigation on the chemical, structural and mechanical properties of carbon-germanium films deposited by dc-magnetron sputtering, Diamond and Related Materials, 7(1998)440-443. E.M. Waddell and B.C. Monachan, Rain erosion protection of IR materials using boron phosphide coatings, SPIE, 1326(1990)144-156. L. Yang-Ping, W. Ning, C. Xing-Sen, C. Hai-Bo and L. Zheng-Tang, Infrared transmissive and rain-erosion resistant performances of GeC/GaP double-layer thin films on ZnS substrates, Applied Surface Science,26 (2013) 538-544. Y. Li and Z. Liu, Properties of gallium phosphide thick films prepared on zinc sulfide substrates by radio-frequency magnetron sputtering, Journal of Materials Science & Technology, 26(2010)93-96. J. Askinazi and A. Narayanan, Protective broadband window coatings, Proc. SPIE, 3060(1997) 56-365. C.Q. Hu, J.Q. Zhu, W.T. Zheng and J.C. Han, Annealing effects on the bonding structures, optical and mechanical properties for radio frequency reactive sputtered germanium carbide films, Applied Surface Science, 255(2009)3552-3557. C. Hu , L. Qiao, H. Tian, X. Lu, Q. Jiang and W. Zheng, Role of carbon in the formation of hard Ge1-xCx thin films by reactive magnetron sputtering, Physica B, 406(2011)2658-2662. J.Q. Zhu, C.Z. Jiang, X. Han, J.C. Han, S.H. Meng, C.Q. Hu and W.T. Zheng, Multilayer antireflective and protective coatings comprising amorphous diamond and amorphous hydrogenated germanium carbide for ZnS optical elements, Thin Solid Films, 516(2008)3117-3122. X. Che, Z. Liu, Y. Li, N. Wang and Z. Xu, Effects of methane flow rate on the optical properties and chemical bonding of germanium carbon films deposited by reactive sputtering, Vacuum, 90(2013)75-79. C.Z. Jiang, J.Q. Zhu, J.C. Han, Z.C. Jia and X.B. Yin, Chemical bonding and optical properties of germanium-carbon alloy films prepared by magnetron co-sputtering as a function of substrate temperature, Journal of Non-Crystalline Solids, 357(2011)3952-3956. X. Wu, W. Zhang, R. Luo and L. Yan, Mechanical and environmental properties of Ge1-xCx thin film, Vacuum, 82(2008)448-454. MIL-C-00675B (MU), Coating of glass optical elements (anti-reflection), January 1964. P. Kazimierski and L. Jozwiak, Transition from amorphous semiconductor to amorphous insulator in hydrogenated carbon-germanium films investigated by IR spectroscopy, Journal of Non-Crystalline Solids, 355(2009)280-286. J. Szmidt, M. Gazicki-Lipman, H. Szymanowski, R. Mazur czyk, A. Werbowy and A. Kudla, Electrophysical properties of thin germanium-carbon layers produced on silicon using organometallic radio frequency plasma enhanced chemical vapor deposition process, Thin Solid Films, 441(2003)192-199. J.Q. Zhu, C.Z. Jiang, J.C. Han, H.L. Yu, J.Z. Wang, Z.C. Jia and R.R. Chen, Optical and electrical properties of nonstoichiometric a-Ge1−xCx films prepared by magnetron co-sputtering, Applied Surface Science, 258(2012)3877-3881. M. Gazicki, R. Ledzion a, R. Mazurczyk and S. Pawlowski, Deposition and properties of germaniumrcarbon films deposited from tetramethylgermanium in a parallel plate RF discharge, Thin Solid Films, 322(1998)123-131. M. Gazicki, Plasma deposition of thin carbon:germanium alloy films from organogermanium compounds, Chaos, Solitons & Fractals, 10(1999)1983-2017. C.N. Zoita, C.E.A. Grigorescu, I.C. Vasiliu and I.D. Feraru, Influence of process parameters on structure and optical properties of GeC thin films deposited by RF magnetron sputtering, Thin Solid Films, 519(2011)4101-4104. J.L. Huguenin-Love, R J. Soukup, N.J. Ianno, J.S. Schrader and V.L. Dalal, The properties of Ge-C thin films deposited using dual hollow cathodes, 1-4244-0016-3/06/$20.00 ©2006 IEEE 114-117. J.S. Schrader, J.L. Huguenin-Love, R.J. Soukup, N.J. Ianno, C.L. Exstrom, S.A. Darveau, R.N. Udey and V.L. Dalal, Thin films of GeC deposited using a unique hollow cathode sputtering technique, Solar Energy Materials & Solar Cells, 90(2006)2338-2345. Y. Yashiki, S. Kouketsu, S. Miyajima, A. Yamada and M. Konagai, Growth and Characterization of Germanium Carbon Thin Films Deposited by VHF Plasma CVD Technique, 1-4244-0016-3/06/$20.00 ©2006 IEEE 1608-1611. S. Chiussi, P. Gonzfilez, J. Serra, B. Leon and M. Perez-Amor, Amorphous germanium layers prepared by UV-photo-induced chemical vapour deposition, Applied Surface Science, 106(1996)75-79. X.S. Che, Z.T. Liu, Y.P. Li and T.T. Tan, Effects of radio frequency power on the optical and electrical properties of germanium carbon films, Journal of Alloys and Compounds, 577(2013)15-18. A. Mahmood, A. Shah, F.F. Castillon, L. Cota Araiza, J. Heiras, M. Yasin Akhtar Raja and M. Khizar, Surface analysis of GeC prepared by reactive pulsed laser deposition technique, Current Applied Physics,11(2011) 547-550.
carbon thin films by VHF plasma CVD, Journal of Non-Crystalline Solids, 354(2008)2355–2358. S. Shrestha, N. Gupta, P. Aliberti and G. Conibeer, Growth and characterization of germanium carbide films for Hot Carrier solar cell absorber, 978-1-4673-0066-7/12/$26.00 ©2011 IEEE 2061-2064. Z.C. Jia, J.Q. Zhu, C.Z. Jiang, W.X. Shen, J.C. Han and R.R. Chen, Effect of gas flow ratio on the microstructure and mechanical properties of boron phosphide films prepared by reactive magnetron sputtering, Applied Surface Science, 258(2011)356-360.